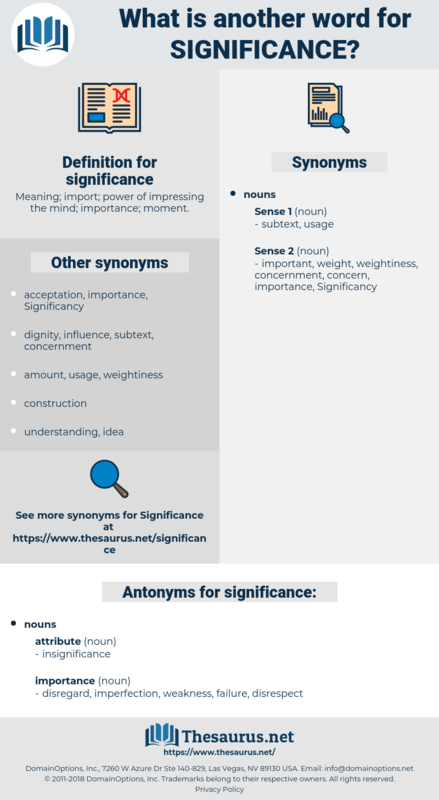 What is another word for significance? Meaning; import; power of impressing the mind; importance; moment. resolutions, difference, sense, pertinence, centrality, consequence, stature, transcendence, appropriateness, implication, factor, relevancy, incidence, resonance, aspect, point, consideration, description, validity, weighting, desirability. Mattered, Assessed, placed, emphasized, defined, recognized, attached, stressed, posed, realized, combined, committed, grown, raised. magnitudes, sizes, IMPACTS, Weights, merits, Roles, proportions. 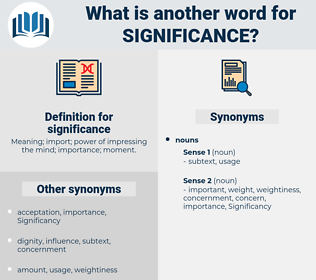 connotation, usefulness, seriousness, essence, bearing, attention, meaning, dimension, severity, necessity, gravity, profile, content, nature, emphasis, scope, interpretation, strength, extent, meaningful, benefit, depth. disregard, imperfection, weakness, failure, disrespect. Exteriority, triviality, unimportance, outside, meaninglessness, exterior. anonymity, disrepute, disgrace, infamy, littleness, ignominy, dishonor, paltriness, puniness, shame, valuelessness, worthlessness, opprobrium, odium, discredit. He hoped she would get the significance of the " our." The man who wrote those lines surely saw the modern world, and realised its significance. consequence, meaningfulness, moment, import, historicalness.